Instant access to professional CISSP exam prep for 180 days. Nothing to download, accessible from any computer. Over 1,000 exceptionally realistic CISSP exam questions, including 19 lite CISSP mock exams and 12 domain tests. Detailed explanations for every CISSP question to clarify why answers are correct. Detailed score reports which pinpoint CISSP CBK Domains which require more study. Generate unlimited CISSP practice exams directly from our question database using our "Create a Test" feature! Priority user support, a personalized Dashboard, tutorials, and Free CISSP Exam Tip Guide Included with Registration! Following registration, your account will be activated and a confirmation email receipt will be dispatched. International payments welcome from all major credit cards. International payments welcome from all major credit cards, eChecks, and PayPal. Following registration, your account will be activated and a confirmation email will be dispatched immediately. All payments are securely processed by Paypal, a secure third party payment processor. Absolutely no payment information is stored by our site or retained beyond processing of this transaction. Our site utilizes Secure Sockets Layer (SSL) encryption technology and is registered with the appropriate certificate authorities as indicated by the seals on this site. For your security, we require that you enter your card's verification number. The CVV2 code is a 3 or 4 digit number, typically printed on the back of your credit card. For American Express cards, it is located on the front. 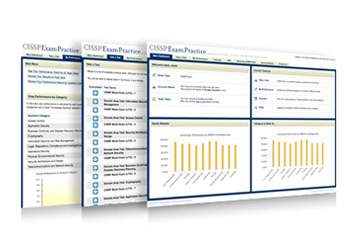 "The CISSPExamPractice site was an excellent way to pin point the exact domains for improvement. It provides a section by section average. It also gives averages of the other CISSP takers which is also a motivating factor. " "It is the only product I have seen which utilizes the same question logic as the actual CISSP exam. If you utilize this training course you will have the ability to apply your already learned knowledge to the real exam very well. The CISSP is a very hard exam which has a broad range of questions and very tricky wording. CISSP exam prep provides an important tool which helped me pass the CISSP on the first try." This site is owned and operated by SSI Solutions, INC.